Superb picture and sound quality for calls, radio, video and apps. 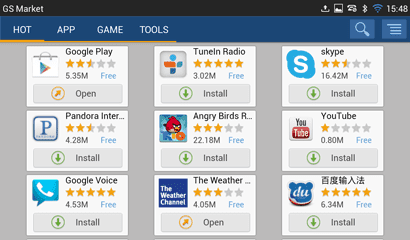 Access to Google Play Store opens the door for the device to be much, much more than just a phone. Can too much of a good thing ever be bad? Access to hundreds of thousands of apps is great, but the device’s internal memory limits the extent of what you can do. Also, bluetooth connection is iffy at times. This is a top-shelf device that’s extremely easy to use. But it probably tries to do too much to ever be utilized at its full potential, because its hardware just hasn’t caught up yet to its software. 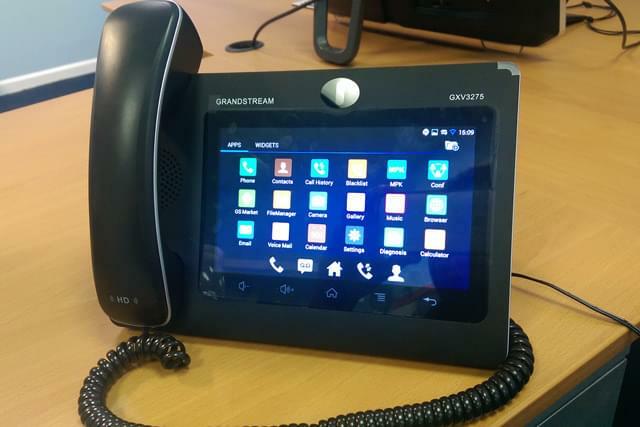 Grandstream decided to go all-in with their latest entry in the desk phone arena: the GXV3275. Most of the gripes we had with the product’s predecessor have been remedied with their latest device. For starters, one of the major critiques of the older GXV3175 was that the device’s default phone functions were cumbersome and difficult to use. You could only make phone calls from the dial pad, for example. In the current iteration, however, you can call from the Contacts app, from the favorites list, from the SMS app, and from call logs. Seems like common sense, but it took Grandstream a few iterations to make this standard. In addition to the beefed-up calling features, the GXV3275 doesn’t just claim to run Android 4.2.2—it really does take full advantage of the operating system. It’s not a stripped down, bare-bones version of the OS at all. The GUI animations are buttery smooth and a lot of the device’s default apps will look familiar to anybody who’s ever handled an Android mobile device before. 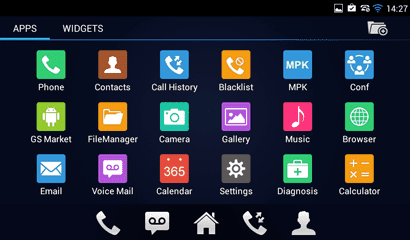 In addition to what the desk phone comes preloaded with, you have the option to dive right into the Google Play Store to really maximize the device’s potential. This is where the GXV3275 begins to blur the line between tablet and desk phone; this is the kind of hybrid device that we should expect to see going forward in the industry. If you want something to nitpick, Grandstream’s decision to completely do away with physical buttons could be a bit of a head-scratcher. Not only does this represent a radical change for the company—even their previous iteration had one physical Home button—but it’s the first buttonless device we’re reviewing here at GetVoIP. Whether this ushers in a new era of touchscreen-reliant devices or not is still up in the air, but the GXV3275 is taking the bold step to the cutting edge. The buttonless design might be a challenge to some users, but Grandstream has done a great job of making this device as user-friendly as possible. Let’s take a closer look at what the GXV3275 has to offer. The great thing about the GXV3275 is that it is by-and-large a communication device that makes things as simple as possible. One of the ways they make things simple is by making the most of the available screen real estate. When you’re in the middle of a phone call, for example, all of your options for what to do with that phone call are available for you on the screen. You can Holdor Mute or End the call. You can access the Keypad. You can switch from speakerphone to handset—and vice versa. 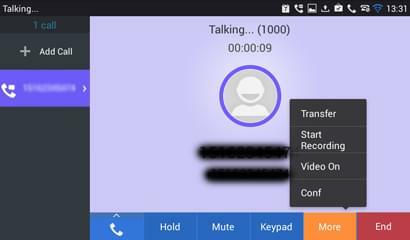 There’s also a More button that appears on the screen that allows you to transfer the call, start recording, turn on video, or begin a conference call. There’s less thinking about how to get things done and more quick access to all your available options. From working with the desk phone, I’ve found that most of the GUI is pretty intuitive. 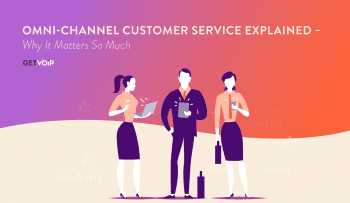 And, most importantly, all of the bells and whistles don’t take away from the fact that the purpose of the device is still for phone calls and video conferencing. If you’re in the call logs, the option exists to call a person directly from there. If you’re in the SMS app, you can check out the contact’s info card and email or call them directly from there. There is a “common sense” approach here with the GXV3275 that makes using the device seem more like fun and less like work. While most desk phones focus on utilizing one videoconferencing platform, the GXV3275 has no such restrictions. And, let’s face it—nobody wants to be stuck on one platform anymore. 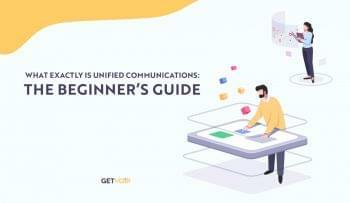 The good news is that you can make use of this device whether you use Microsoft Lync, Skype, Google Hangouts, or any other videoconferencing app from the Play Store. 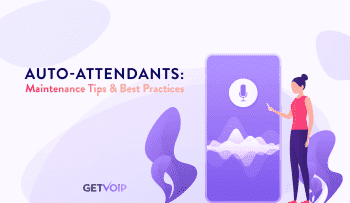 Or, if you just want to plug in and get going right away, take advantage of Grandstream’s Free IPVideoTalk which lets you connect to up to 6-way audio conferencing and up to 3-way video conferencing. Not bad for standard features. The sound quality on the GXV3275 is fantastic. Grandstream boasts the device’s HD audio in the documentation and the handset even has an “HD” logo on it. They’re not kidding. When using the headset, the audio is pristine, and even the faintest mumbles come out clearly. The phone’s HD wideband audio is its most impressive feature, though. Not only do you hear the caller’s voice clearly on speakerphone, but the advanced acoustic echo cancellation makes sure you can be heard despite all the din around you. I tested out the YouTube app and some browser videos to fully test out the range of the sound quality, and it’s safe to say that I’ve come away impressed. While you won’t get much low-end and bass from vocals or music that you’d expect from an actual tablet or phone, you’ve got to remember that this is still a desk phone. And even still, the sound quality isn’t compromised so much to make listening to music or watching videos a terrible experience at all. Videos from the browser and other apps look great on the GXV3275’s 7” screen. But since this is still a desk phone, let’s talk about its call video quality. 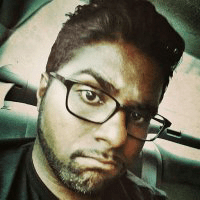 I tested out its video capabilities on a few apps. 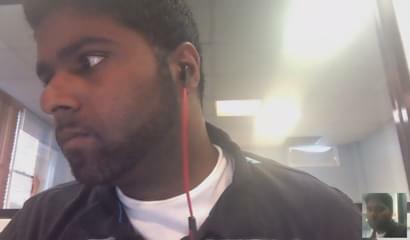 Here’s a screenshot of a video call. To say the least, the quality here is quite impressive. There are no apparent lag/flicker issues and the images end up rendering fluidly. And if you’re not satisfied with the camera angle of the device, there’s a little knob behind the camera that helps tilt it up or down. So, if it really matters to you, the camera can get your best side every time. The device has 5 backlit soft keys right below the screen. From left to right, the buttons are: volume up, volume down, home, menu, and back. The benefits to keeping them soft keys as opposed to actual plastic buttons are that there are no noisy, breakable buttons to press on this device and the whole device looks minimal and clean. When the screen is off, pressing any of these soft keys will wake the device and all of the soft keys work no matter what app you’re currently using. In this day and age, a device is only as good as the ecosystem in which its apps exist. While Grandstream comes pre-loaded with a healthy selection of business-ready apps (e.g. FileManager, Calendar, Recorder, etc.) and its own rudimentary app store, it has harnessed the power of Android’s ecosystem to really take things to another level. I downloaded Google Play Store from the default app store and I was able to install Gmail, YouTube, and Google Voice from there. Grandstream’s pre-loaded apps are solid but Google’s ecosystem of apps is really what opens the door to making the GXV3275 a robust hybrid communication device. The GXV3275’s pre-loaded launcher allows you to add apps and widgets to its workspaces. You’ve got 4 rows and 6 columns per workspace to play around with and customize to your heart’s desire. I was able to add workspaces by pressing Menu and then selecting Preview. The system will allow up to 9 workspaces—more than enough for even power users. 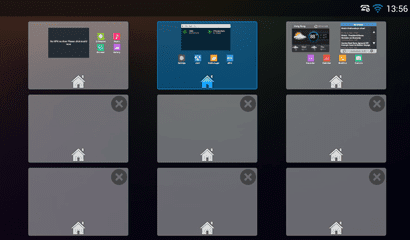 The beauty of the operating system is that you can have access to all the apps and widgets you want by having control of how you organize your workspaces. So, set yourself up for productivity, or video, or audio, or time-killing apps. With the GXV3275, it’s your call. One thing’s for sure: you’re not gonna get tired of all the GXV3275’s potential. For starters, it comes with dual Gigabit ports for impressive data transfer speeds. 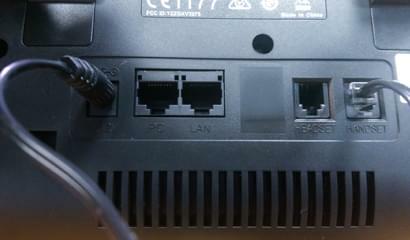 Grandstream also doesn’t skimp on the auxiliary ports for this device. You’ve got dual USB ports, a SD card slot, RJ9 headset jack, 3.5mm headset jack, and a mini HDMI port. 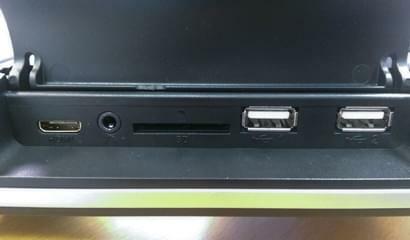 The mini HDMI is particularly fascinating because it allows you to connect the GXV3275 to an external monitor in case you ever want to blow up whatever you’re looking at onto a bigger screen. Perfect for large group video calls or meetings. One of the things you’ll notice quickly about the GXV3275 is that its handset is designed exclusively for phone call audio. It doesn’t handle any other audio from the device. So, if you’re in the middle of watching a video and you think you can listen to the audio through the headset, don’t even bother. That’s not an option with this device. This may not be a deal-breaker for most users, especially since there’s a headphone port on the device for moments like this. But picking up the headset will take you directly to phone dialer every single time. The GXV3275 is a tricky device. On the one hand, Grandstream opens up a world of options to you by giving you access to Google Play Store. But just because you have a ton of options available to you doesn’t mean it’s necessarily a good thing. Especially for this device. For starters, the device has under 1GB of available RAM. This is great if all you’re running is a dialer and a call log. But, let’s face it—with the GXV3275, you’re going to want to add apps and push its limits a bit. I noticed some minor lag when I tried leaving the browser, YouTube, Play Store, and a few other apps open at the same time. So, while options do exist for what you can do with the device, you might be better off not doing too much at once. It’s not going to be able to handle that. Don’t get me wrong. This is a hybrid device, for sure. It has a feature set and versatility that’ll remind you of today’s premier tablets. But that’s where the comparisons end. The truth is that the hardware for desk phones—even the robust GXV3275— hasn’t caught up yet to its software. So, yes, you can switch between video conferencing platforms and do plenty to customize your user experience. The drawback, however, is that you won’t be able to do too much in one session; there’s just not enough memory on the device to be able to handle all that. Maybe it’s something only a power user will notice, but it’s still noticeable nonetheless. I tried to send a few gallery items to some in-range office devices through the GXV3275’s integrated bluetooth. The process was fickle at best. This may just be an issue with the other devices I was trying to connect to the desk phone, but it seems unusual that my desktop, laptop, and phone would all have mysterious bluetooth issues simultaneously. I was able to get the bluetooth working after a few attempts, but it’s no killer feature for the device. That’s for sure. The GXV3275’s 7” screen is a beauty when compared to other desk phones in its class. But the screen resolution of 1024×600 still leaves a lot to be desired. I found that browsing some websites was a pain—when they have retina and other high resolutions in mind for their site design. If you happen to get stuck on a website that isn’t geared for your screen resolution, prepare to scroll a lot. And I mean a lot. That’s not a pleasant experience on any device—especially for a desk phone. With so many industry-leading features under its hood, you might forget that the GXV3275 is still every bit the desk phone that it’s marketed as. While I have an inherent Android bias—since I already use Android devices regularly—Grandstream doesn’t forget about the device’s target audience: anybody that needs a business-ready video conferencing phone. Keeping that in mind, the GXV3275 does a fantastic job of balancing its hybrid approach to this arena with a level-headed common sense of utility. Right out of the box, I didn’t have to install any apps to make the most of the device. 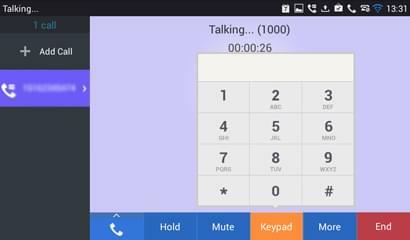 I just punched in a phone number, called it, and was given the option to add lines to the audio conference or to turn the call into a video call via Grandstream’s very own Free IPVideoTalk. The first time I tried a video call on Google’s Hangouts on the device, the audio didn’t work. But that was the only issue I’ve noticed so far—and that was just on the initial app launch. I haven’t had audio or video connection issues since. The GXV3275’s handling of apps is brilliant. And that’s to be expected because it relies on Android’s 4.2.2 operating system. Switching between open apps, organizing home screen widgets and apps, and dealing with the notification bar control panel are all basic facets of even the most complex current Android tablets. This is really more than just a desk phone. 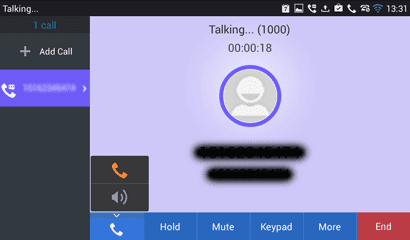 I noticed my first lag issues when I had a few video conference applications open at once—which could happen because of Android’s default handling of recently opened applications. There is a slight-but-frustrating delay when trying to get into a new call, open an app, or even switch to a recently opened app. While I could have remedied this by downloading an app to take care of memory issues, I resorted to the most reasonable action I could think of—a reboot. Rebooting the device didn’t take an inordinate amount of time. If anything, it was less frustrating to wait for a reboot than to deal with even a little bit of lag. The moral of the story is that you should avoid using too many apps at once. This seems like common sense, but you’d be surprised how easy it is to get duped by the GXV3275’s functionality. You’ve got a lot of options with this device, but you just need to manage your memory wisely when you’ve got a few things open at once. From any screen—as long as you’re not touching the screen—holding the Menu button for a few seconds will initiate a screen capture. The photos get saved to the device’s SD card slot by default, but this can be changed. From any screen—as long as you’re not touching the screen—holding the Home button for a few seconds will bring up a list of recent and running apps. Swiping the apps to the right or left will kill their processes instantly. Clicking the apps will take you right to them. While the default keyboard does a pretty good job, Google Play Store gives you the option to try out more sophisticated keyboards. So if you’re the kind of person that likes a smaller keyboard or if you prefer swiping text rather than typing text, don’t forget to check out the other keyboards that are out there. The GXV3275 comes with a tiltable CMOS camera so that you’re not locked into one single angle for a video call. In fact, if you’re feeling shy, tilt the camera all the way up or down so that you don’t have to be seen during a video call. Considering the fact that similarly-powered tablets and less-robust desk phones are priced higher than the GXV3275, Grandstream’s modern marvel is reasonably priced at $228.85. This is a device that definitely gives you more bang for the buck—it does more than what you’d expect to see from other devices in the video phone arena. Overall, this is a fun device to use. Grandstream is pushing the envelope with the GXV3275. If you’re just using it for phone calls and video calls, it does more than enough. And if you’re a power user that wants to do a lot more with it, you can do that, too. There are definitely weaknesses, but they can be remedied if you just do even some casual checking up on your memory. By abandoning physical buttons and harnessing the full power of Android’s operating system, it’s clear that they’re aiming to change the way you look at desk phones. And it’s even more clear that they’re aiming to change the way that other desk phone manufacturers look at their own products. The software advancements are available now, and as businesses continue to evolve, it’s up to more manufacturers to marry these advancements with user expectations. The GXV3275 is a good first step into the arena—and it’s a game changer of a first step.